Watermelon Popsicles! | Eat More Plants. I’m a firm believer in “make it look pretty and anyone will eat it”. And it’s not that I’m trying to trick anyone into eating veggies or hide them, in fact, I’m doing the opposite. I make sure my daughter sees me putting kale and spinach into our food. I want her to know that we eat these things because they’re healthy. Although she’s not really opposed to them…she will go in the garden and eat kale straight from the plant. 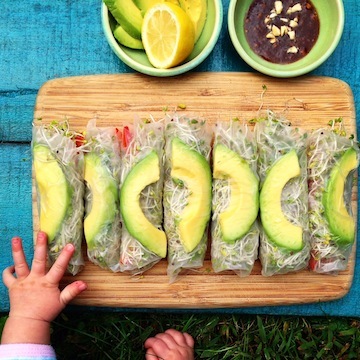 It’s just a little extra time and effort that goes into incorporating healthy food into each meal. They don’t have to be expensive and hard to find ingredients. 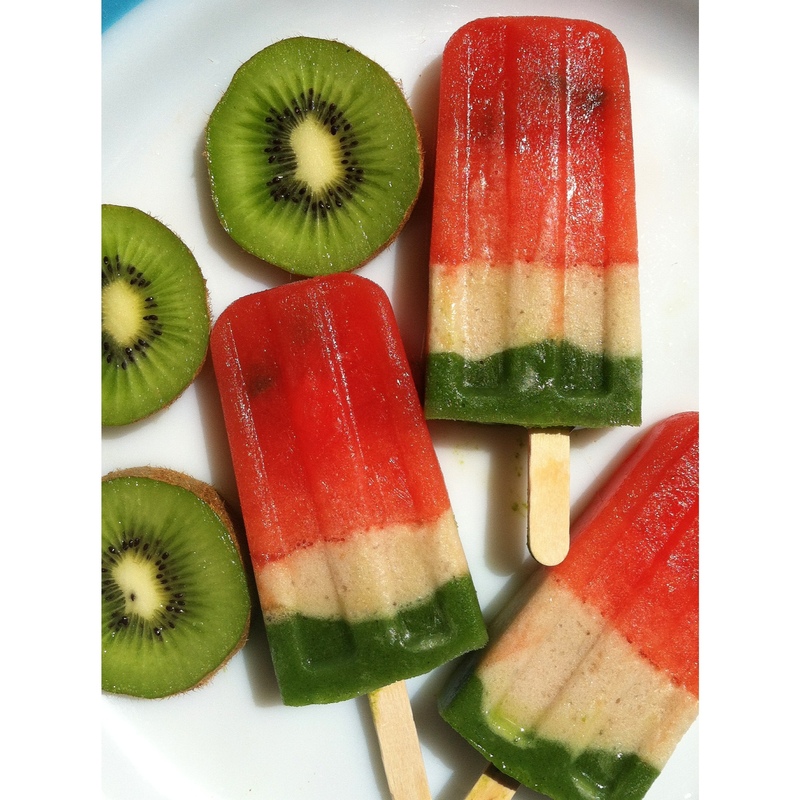 One of my favorite ways to get some extra green veggies are in popsicles. Popsicle molds aren’t expensive and they’ll last you a looooong time. Blend up some fruit and veg with ice and a little maple syrup if need be and freeze it! The popsicles I made today are in the style of a slice of watermelon. I first blended watermelon and poured it in my molds, only filling each mold about two thirds of the way full. I waited about 2 hours for the watermelon to freeze almost all the way and then pushed a few chocolate chips into each mold, like the seeds. Also, push your popsicle sticks in at this point and make sure they go at least an inch into the watermelon. If they’re too frozen, let them sit out for 5 minutes to soften. I blended frozen banana with a few tablespoons of coconut milk to make the next layer. This one comes out pretty thick so it’s easier to spoon it in. Make sure your watermelon layer is sufficiently frozen so the banana doesn’t fall into it. For the last layer I blended frozen baby spinach (salad grade, not the kind you buy in the freezer section) with some grapes and kiwi. Let them freeze for another few hours before removing. A good tip is to run hot water over the molds before trying to pull one out to prevent them breaking.